SHENZHEN, China, Dec. 29, 2018 /PRNewswire/ -- UBTech, a leading global AI and humanoid robotics company, announced on December 26, 2018 the signing of an agreement with New Shougang High-end Industry Comprehensive Services Park (Shougang Park), whereby the two parties will collaborate on the development of high-tech demonstration projects. On the same day, Shougang AI Industrial Park also commenced operations. 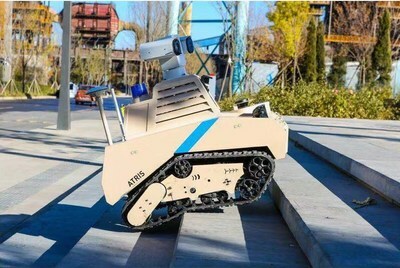 UBTech's all-terrain patrol robot ATRIS will provide intelligent security support for the park. ATRIS enhances the efficiency of security patrols within Shougang Park and reduce the park's costs associated with security staff. UBTech plans to continue working with Shougang Park to promote the development of the AI-enabled digital community and improve the industry ecosystem characterized by AI applications, with the aim of becoming a model for Beijing's ongoing urban development and supporting the city's hosting of the 2022 Winter Olympics. ATRIS enables round-the-clock patrols and monitoring of sensitive areas within the park through accurate identification of persons within its range of vision even when cloudy, foggy or at night. ATRIS also comes with a "SOS" emergency call button that automatically calls for help when an emergency situation has been identified, allowing for real-time communication with the park's security center. Founded in 2012, UBTech is a global leading AI and humanoid robotics company. In 2018, UBTech achieved a valuation of USD$5 billion following the single largest funding round ever for an artificial intelligence company, underscoring the company's technological leadership.